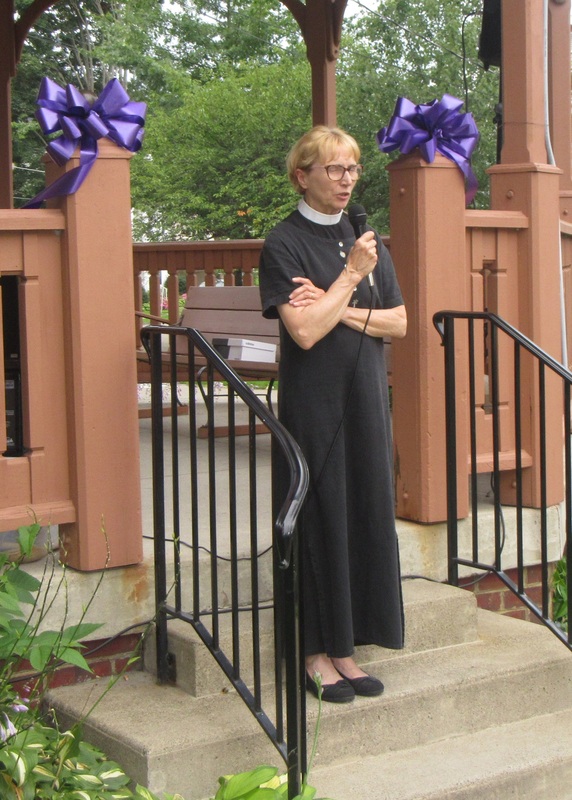 Celeste Kranick welcomes attendees and public officials to the Color the County Purple overdose awareness event held on the Wyoming County Courthouse lawn on Aug. 26. Tunkhannock residents driving in the vicinity of the Wyoming County Courthouse this past weekend might have noticed the historical building basking in an unusual hue each evening. 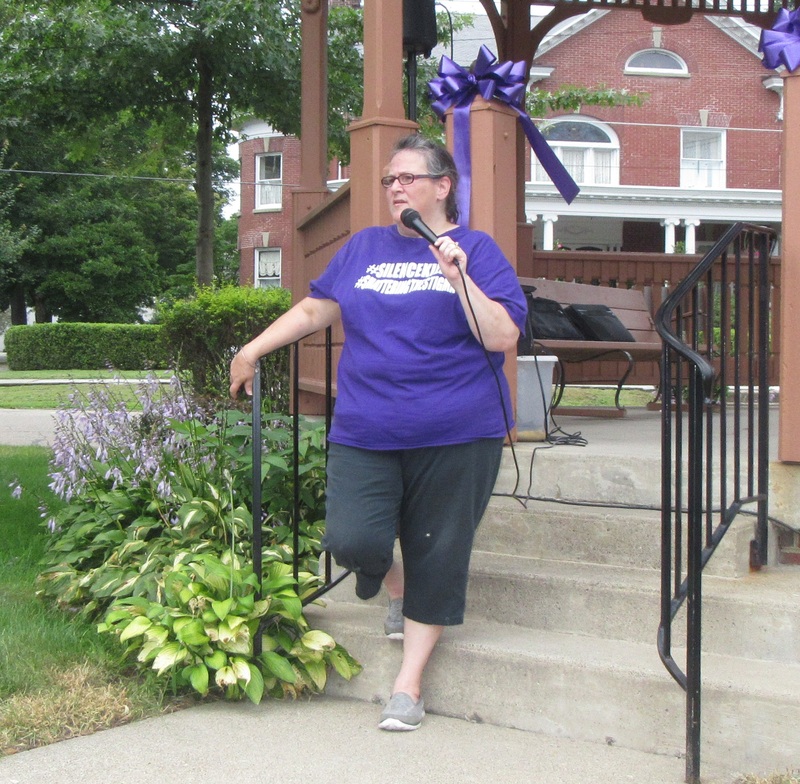 The county commissioners had agreed the previous Tuesday to personally cover the cost for special lights and films for the Color the County Purple initiative that preceded an overdose awareness event that was held on the courthouse lawn on Sunday. 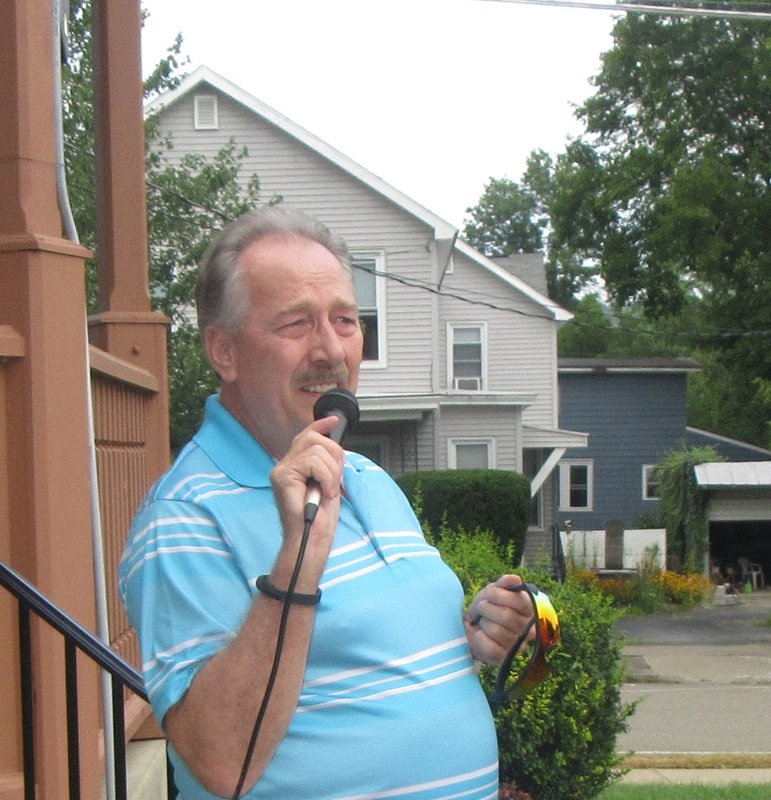 Commissioners Tom Henry and Judy Mead (below) also spoke at the gathering, which was largely attended by the officials who are trying to get a handle on the situation and family and friends of loved ones lost to overdose and addiction. Numerous attendees accepted an open invitation by event co-organizer Celeste Kranick to share some thoughts and their own stories with the crowd. 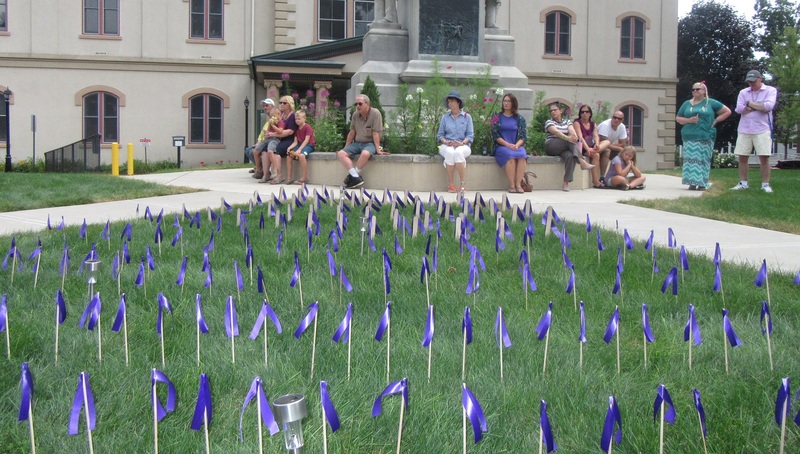 Two hundred fifty four purple ribbons fanned out across the courthouse lawn between the soldiers and sailors monument and an American Legion monument honoring veterans. The larger ribbons toward the front represented the 17 people who die from overdoses on average each day in Pennsylvania and the 39 lives lost to overdoses in Wyoming County alone since 2017. The remainder paid tribute to the 198 people estimated to die each day across the nation, a number that has grown steadily from less than 20,000 per year in 1999 to more than 70,000 last year. While deaths from cocaine and methamphetamines continue to rise, they are far outpaced by overdoses related to heroin and synthetic opioids. “And those are just the overdose deaths that are reported,” notes Kranick, confident that the actual numbers are much higher. Kranick welcomed those in attendance, referring to Sunday’s gathering as a somber event in light of a rash of recent overdoses in the county. 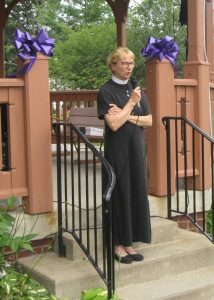 Her sentiment was echoed in a prayer offered by Rev. Lou Divis (below). 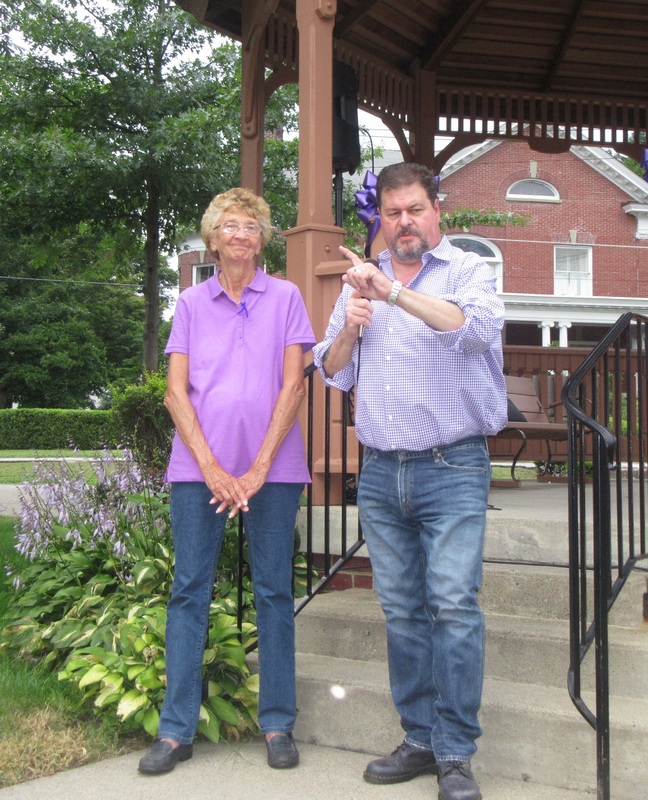 Commissioners Henry and Mead were unified in a message of hope, noting that county officials have enacted a number of measures in an attempt to curb the opioid epidemic and to provide options for those seeking help, including prescription and syringe drop-off boxes inside the courthouse. County human services director Mike Donahue got a positive reaction from the crowd when he noted that the county is inching ever closer to opening a rehab facility. Donahue garnered additional appreciation from the crowd when he admitted that he is uncomfortable with the term “warm hand-off,” which refers to law enforcement placing a victim of an overdose into the custody of a facility or agency trained to deal with the issue in lieu of an arrest. 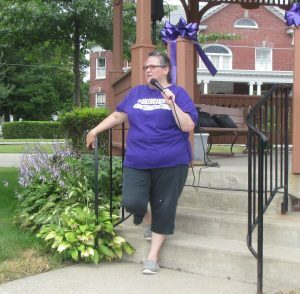 Sandra Vieczorek, who founded Wyoming County Cares more than a decade ago after losing her son to a heroin overdose, thanked Kranick for her efforts, citing the visual impact of the purple ribbons, and insisting that events such as this are not in vane. Kranick credited a number of individuals in the community who donated the ribbons, posters, sound equipment and other materials for the event. Mead reminded those in attendance that a sheet with first names and last initials of those lost to overdose or addiction that was started at the Not One More rally in 2016 will hang in the courthouse for the rest of the week and that visitors are welcome to add a name to it. 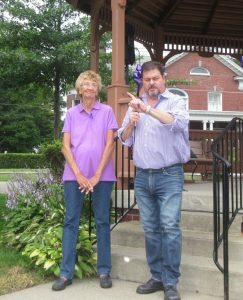 Lizz and Lenny DeWolf set up a table nearby on which a large amount of literature and pamphlets describing addiction and providing information about organizations equipped to help can be found.